It suddenly felt like there was too much on my plate with the surprise announcement of two extra characters, three new stages, and more content in yesterday’s update for Super Smash Bros 4. I believed this article would be about Lucas’ return and the Miiverse stage but Nintendo have made a lot of fans extremely happy by not only resurrecting another veteran to the Smash mix, but adding a new challenger that brings his own control scheme never seen in the series. Seeing another fighting game character in Smash Bros isn’t something I expected to see, but I’m not complaining at all about Street Fighter’s Ryu being introduced; playing as him is a blast, all of his famous moves are here and as far as Smash Bros goes, he has quite an innovative moveset. Joining him in the update are the already-announced Lucas along with Fire Emblem’s Roy, returning from Super Smash Bros Melee. Purchasing the entire bundle of content will set you back a little more than Mewtwo’s did; the maximum price bracket here – which gives you everything across both versions of the game – is £26.68, but there are smaller bundles that give you various parts of the new content. Ryu isn’t the only new content hailing from Street Fighter. Suzaku Castle, his stage from Street Fighter II, has joined the growing list of arenas. Suzaku Castle brings some Street Fighter touches with it too; the music will speed up as the battle draws to a close, either when the timer is low or a fighter is reduced to one stock. This happens in Ryu’s native series when a fighter’s health metre is running low. There are also signs on the stage that break when fighters are knocked into it, again harking back to the classic Street Fighter II. The stage also boasts two impressive new remixes among its music playlist. Ryu’s stage music has been given a remix with some true Smash Bros flair, along with a new rendition of Ken’s stage. Completing the playlist for Suzaku Castle are four retro Street Fighter tracks, two each for Ryu and Ken. Ryu shows his roots through his sound effects. The high-pitched pinches for weaker attacks and the heavy, crunching blows for heavier ones have been pleasantly imported into the Smash series. What is most impressive about Ryu is his moveset; the Hadouken, Shoryuken, Focus Attack and Tatsumaki Senpukyaku (that’s the whirly kick) are all present and correct, but they’ve also inherited some input commands from Street Fighter. Moving the control stick in a particular way before pressing the attack button will cause Ryu to use a more powerful version of the special move. Ryu’s yell of attack will also differ slightly, letting the player know they succeeded. This command list creates a risk-reward scenario; inputting the original commands of the Shoryuken will not only make the attack more powerful, but gives the move invincibility. In addition, several of his attacks have a strong and weak variant that depend on if the attack button is held down or tapped respectively. The fighter seems to be centred around creating combos, and many players will take great satisfaction in discovering potential attack combinations. Ryu is also the only character in the game to have two Final Smash attacks. If Ryu is not near any other fighter, he will send out a Shinku Hadouken that acts similarly to Mario’s Final Smash. If Ryu is close enough to an opponent, he’ll perform a Shin Shoryuken – he strikes with two attacks before finishing with an almighty uppercut that can earn a KO at a low hit percentage. Both Final Smash attacks are fantastic displays that will delight both Street Fighter and Smash Bros fans. Lucas finally returns from Super Smash Bros Brawl, himself originating from Mother 3: a game that was never released internationally and a request to do so caused a fan to be set on fire by Reggie Fils-Aime last year. 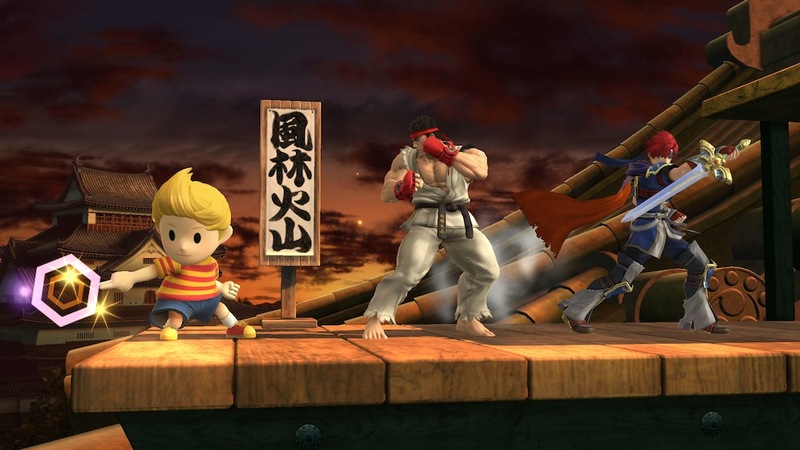 Lucas remains largely unchanged from Brawl and his moveset is still very similar to Ness’ with a few differences. The PSI Magnet only covers his front rather than in a bubble around him, and he has the PK Freeze instead of PK Flash. He still boasts what is advertised in-game as the most powerful smash attack with his Up Smash. Roy retains his special moves from Melee, but has been given a few more changes that make him more distinguishable from Marth than Lucina. Many of his sword attacks are visually aided by the element of fire, and his blade hits enemies harder at the base rather than the tip – the inverse of Marth’s sword. The other stages added are the Nintendo 64 stage Dream Land – with the inclusion of Whispy Woods – and the long-awaited Miiverse Stage. Much like Roy, Dream Land will please many older Smash Bros enthusiasts, and Whispy Woods forms a minor stage hazard that will keep fighters on their toes as they duke it out. The Miiverse Stage is well implemented too; each fighter has their own Miiverse page where users can create posts to show support. More posts show up in the battle during significant moments, such as a KO or a Final Smash. If nothing else, the posts can be highly amusing and it’s a wonderful way to involve the community. The final additions in the update are even more Mii Outfits and trophies. Interestingly two other fighting games – Virtua Fighter and Tekken – are represented through character-themed costumes. There are a further two outfits hailing from the Mega Man series with MegaMan.EXE and Zero. Animal Crossing’s Isabelle also has her own adorable costume that seems to wield a party popper instead of a gun. Last but not least there are three pieces of Splatoon headgear for the Mii Gunner characters, and the Inkling Outfit equips the fighter with the Splattershot weapon. Much like the first batch of Mii Outfits, these are a minor aesthetic addition for anyone who wants them. It is quite amusing to see Heihachi Mishima’s outlandish hairstyle put onto a Mii, though. 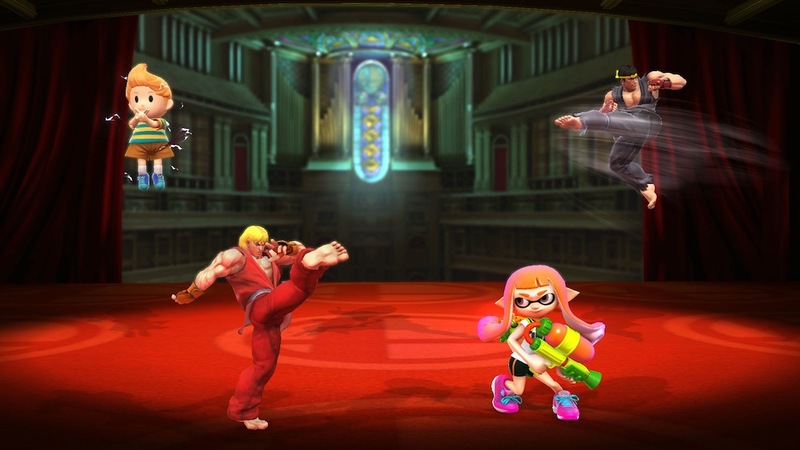 Street Fighter’s Ken appears as a trophy alongside an Inkling Girl, and I have a feeling that this won’t be the only Splatoon content we see in Smash Bros. Look out for some incredible trophy descriptions as well (I’m looking at you, Inkling). The new fighters have three trophies each too, two of which need to be unlocked through Classic Mode and All-Star Mode. 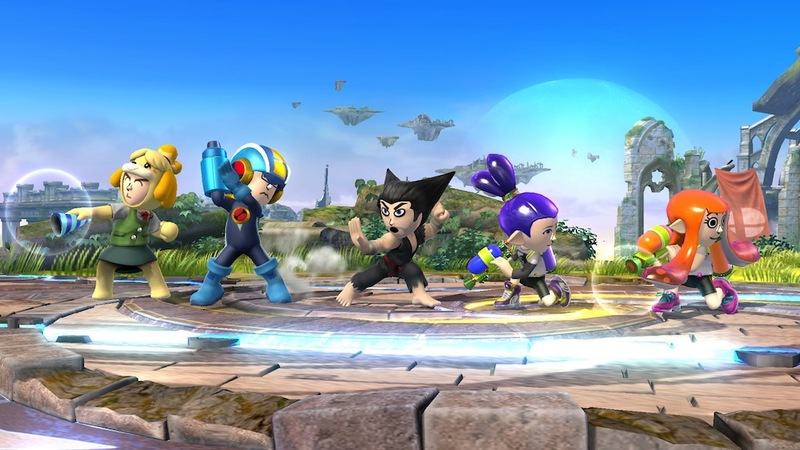 By the way, the second stage of All-Star Mode now has nine opponents. Have fun! This has been the largest update to come to Super Smash Bros 4 since it was released, and it could hold that feat for a long time. Having said that I’d consider it a possibility that Sakurai and co. will add veteran fighters alongside newcomers in a similar manner to this one in the future. What’s exciting now is that I believe the next challenger will come from the Smash Bros Fighter Ballot. No matter who the next fighter is going to be, the Smash Bros team will know how to get its audience hyped. That’s an attribute that isn’t going to disappear any time soon. ← Nintendo’s E3 Events Bring the Show to You in Europe!